These dishes are a truly rare find. Pictured here are some of the ones I found recently, mostly in this beautiful shade of yellow. The backstamps on the undersides indicate they were made of porcelain, in the US, by Winfield China. I would date these to the late 40’s or early 50’s. The pattern on the floral ones is called Bird of Paradise. 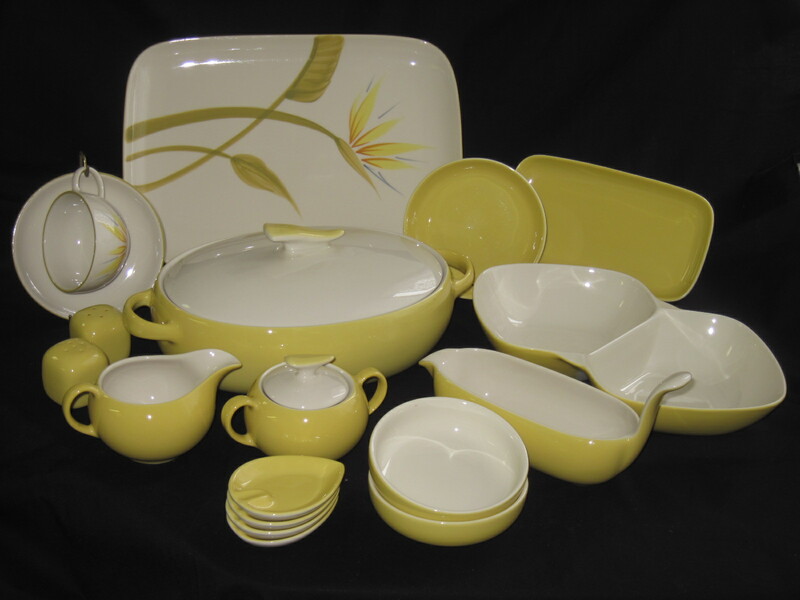 I have not been able to determine the pattern name of the plain yellow dishes. There are about a dozen small dessert sized bowls, 8 individual ashtrays, 9 small side plates, 2 rectangular serving dishes, 2 sets of shakers, 2 creamers, 1 covered sugar, 1 gravy boat, 1 large casserole, 1 smaller casserole (not pictured), 1 divided serving bowl, 6 cups and saucers and 1 large platter. The smaller casserole dish has a chip on the inside rim which is hidden by the lid. Two of the side plates have hairline cracks. All the other dishes appear to be in excellent condition, showing little wear. I am still researching these dishes for values and will list the prices at a later date. Once I have them priced, they will be available at my booth in the Almonte Antique Market. If you are interested in any of these pieces, please contact me for further information. I am willing to sell individual pieces as this is not a complete set and there are no dinner plates. To see more mid century dishes, please visit my booth at the Almonte Antique Market in Almonte ON, just 30 minutes west of the city of Ottawa ON. Open 7 days a week, from 10am to 5pm, all year long. Please note: Most of these dishes are now SOLD!!! Only a few pieces left.